Thanks for your visit--it means the world to a new blogger. But, when I came back to tell you, what a wonderful surprise to read about your place being featured in the magazine! Congratulations. I was just in that area of California in February and fell in love. Can't wait to see the pictures from the photo shoot--they will inspire me, I'm sure. So exciting, Delores. I know you are on cloud nine! I love that book. Have one and need to get the new one. Can't wait to see your spread when it comes out. Exciting news Delores! I am not surprised your home will be featured in Tuscan Style. It is perfection! Anything is possible when we follow our dreams. So happy for you, I look forward to seeing behind the scenes after the wonderful event. Love your blog. It always inspires me. Congratulations on being chosen for the magazine photo shoot. Very exciting! That is wonderful, and you deserve it - I think the blue wheelbarrow should stay! How exciting, Delores! I'm not surprised that your beautiful home is going to be featured. It's gorgeous. Congratulations and I can't wait to see the photo shoot posts. Congratulations !! How exciting for you. I am not surprised as both of your homes are beautiful. Hei Delores...In der Toscana zu fahren ist mein Traum...diese Stile hat was mit Licht,gemütlichkeit...Urlaubs-Flair...wunderschön!Schöne woche meine liebe.Bussi.Lu. *** Welllllll, it's about TIME that MORE people had the opporunity to see this oh-so-fabulous, and sooooo beauuutiful place of yours, Delores! I'm THRILLED for you~~~~ couldn't happen to a nicer or more deserving "pal"!!! Can't wait to see it!!!!!!!!!!!!! Oooooohhhhhh........I AM SO PSYCHED FOR YOU!!!! You/the house are SO DESERVING!!! I have long believed that your home there epitomized Tuscan style and it will be PERFECT for that publication, one of my favorites!!!!!!!!!!!!!!!! Hi Delores, Congratulations! I have admired not only your homes but also the photographs which you have shared with us in your blog posts. I remember sprucing things up, weeding and washing windows when our house was chosen to be in a magazine. We had an inside photographer and an outside photographer. The inside photographer canceled several times. That meant washing the many large windows many times. Look forward to seeing more of your beautiful houses. Oh, Delores! This is wonderful exciting news! I'm so proud for you and what home to showcase than yours? It's absolutely gorgeous! Can't wait to hear and see more about it. I am surprised to be one of a mere 1000 pioneers! I was sure that 10s of thousands escaped to Vignette Design daily. I feel positively trendsetting! Love your style, would love to quit my job tomorrow and create the sort of happiness you do in people's homes. Please DO sign me up for the fabulous butter slab - it would look sublime in my 1905 kitchen, soon to be remodeled from early 80's 'landfill' style to timeless English Country. WOW THIS IS HUGE NEWS!!!!!! Congrats...sooo exciting, I love this magazine and buy every single issue that comes out....its always so full of beautiful inspiration! SO excited for you, cannot wait to see and hear more. Congradulations! My new friend. I was logging on to say thanks for your great comment on my blog and here I see your exciting news that so Amazing!! I cannot even imagine your excitement, I'm excited and it's not even my house. I'll be anxious to see it all and get the book. Congratulations! All I can say is why did it take Bonnie so~o~o long!!! Your home is gorgeous!!! I have that exact copy of the magazine and it is one of my favorite bedtime reads. I'll be anxiously awaiting your news of the photo shoot! Thank you for sharing your wonderful news with all of us in Blog Land!!! Can't wait to hear all about the process and the finished article. It is so exciting and well deserved! Your home is beautiful. So happy for you. Delores~ WOW, so exciting and wonderful and amazing and... just WOW! Congratulations! With your 1000+ followers and all the many who secretly stalk you... it'll be the best selling issue yet. Can't wait to see and hear all about it... and congratulations to Ms Broten for her, obviously, perfect style and taste! What exciting news! I bet you were speechless as the news sank in. can't wait to see the photo's. Your home is beautiful so you deserve evey moment of fame. Congratulations Delores!! I am so thrilled for you! This is so exciting. Can not wait to see your feature! Congratulations! This is so exciting ~ I can only imagine how thrilled you are. Congrats, how wonderful. Just wondering, how did you get the little fleu del lis in your http address instead of the orange blogger B? Congratulations, Delores!!!! I'm so happy for you and can't wait to see your beautiful home featured in a magazine I buy and almost devour every issue of!! Your homes are beautiful and I'm so proud and happy for you!! Can't wait!! Delores, I couldn't be happier for you! I have always thought your beautiful homes deserved to be in a magazine and what better one than Tuscan Style. Congrats!! Tuscan Style is one of my favorites! Congratulations!! This is such exciting news. I was searching for this magazine today to take with us on our vacation to San Diego but didn't find it in the store. Now I have to subscribe to it so I don't miss the issue you will be featured in. that is pretty exciting! I love TS magazine- I got very distracted looking at it the other day when I was at Costco! LOL! congratulations. Congratulations! It's so much fun to see bloggers you read featured in magazines and TS is such a lush publication! Can't wait to hear what all they do to 'stage' your home! Congrats Delores! How exciting for you. Can't wait to get my issue of your beautiful home inside. congratulations Delores!!! SO happy for you!!! I can't WAIT to see th earticle!! And send hugs to Bonnie from me!!! I thank you for sharing your life, homes and creativity with your thankful public through your beautiful blog. Such a feast of talent and good taste. Congratulations, this is so exciting! Your home will be perfect for publication. It's a tremendous amount of work to get ready for the shoot, but when you see your home in the magazine and hopefully on the cover, it will all be so worth it!!! Congratulations Delores!! I am so happy and excited for you! I love this magazine and can't wait to see your beautiful home featured in it! Great news, Delores! I can't imagine a more perfect setting for this magazine. I look forward to seeing the article and your account of the shoot. it doesn't surprise me at all. i've long thought your beautiful style looked like something out of a magazine. congratulations! I am so excited for you !!!!! I can't wait to show the pictures of my friend's house... I sure know a style maker when I see one. The minute I saw your Asti home I KNEW it belonged in a magazine. You are so humble and deserving of it. Can't wait! Congratulations, that is so awesome! I just discovered Tuscan Style mag. a couple of weeks ago & fell in love with it. I'll be so excited to see your feature. What fabulous news. 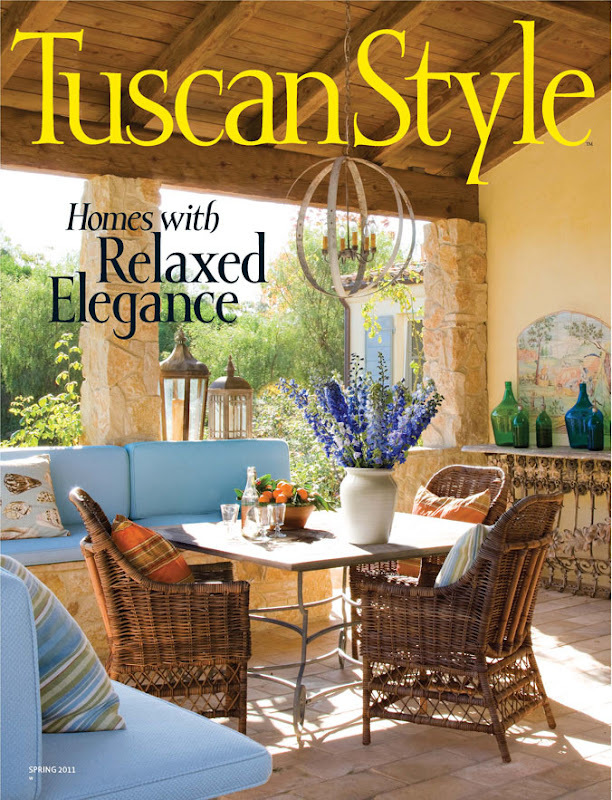 I have the most recent Tuscan Style magazine and just can't wait to see your beautiful home featured in a future issue. Congratulations!!! Wow - what wonderful and exciting news! Congrats! What exciting news! I'm looking forward to the details and photos~ Your property & home are beautiful! Congratuations. I look forward to reading this! Also, what about a feature on Ventura. That you have him on your staff and you hold him in such high regard, means he is most special. you will love bonnie. she just photographed by kitchen. she is soooooo sweet! i love your new kubu chairs. they are gorgeous. i want my daughter to get those for her new apt.